It’s never easy to move into a new town — whether you’re a human, or a dog, or whatever. “Bacon is a lazy French bulldog who loves Westerns, and has a secret friend who happens to be a cat. When he and his owner move to a new neighborhood, Bacon embarks on a quest to get to know all of the neighboring dogs. He soon discovers that they are a collection of weird and rather particular animals. 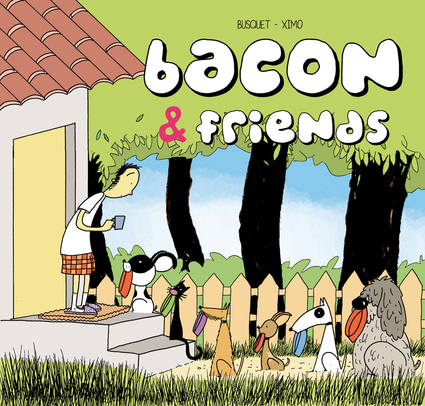 Humorous and witty, the escapades of Bacon and Friends are translated from a popular Spanish web comic.” A comic written by Josep Busquet and illustrated by Ximo Abadia Perez, in fact. This softcover black & white collection is coming out from Kettledrummer Books at the end of July, and it’s available for pre-order at Sci Fe Genre.